Beverly Sills' estate was auctioned yesterday, and opera fans paid more than $500,000 for items ranging from opera-costume sketches she displayed in her apartment (going for as much as $3,400 EACH!) to a collection of opera scores with her own notes as well as notations from her friends and composers that was sold for $8,750. I think I’d study those scores for some insight into her musical genius…though if I paid that kind of money for them, maybe I’d just keep them safely on display. What about you? 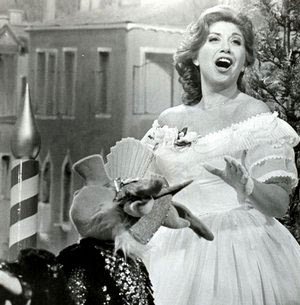 Did any of you ever have the opportunity to see the great Beverly Sills perform?